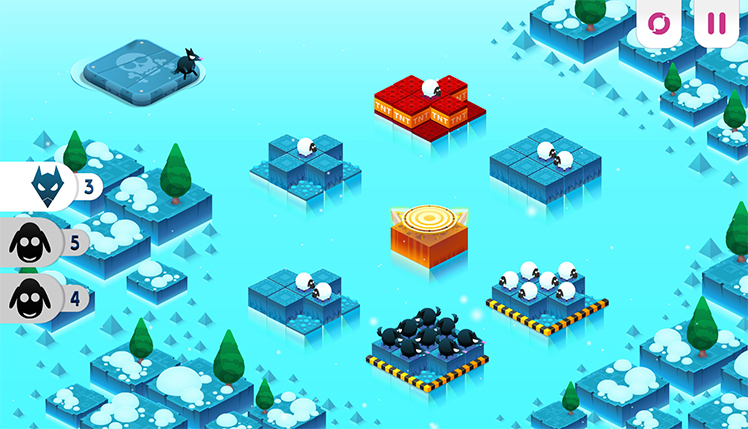 Developed by Bread Team and tinyBuild, Divide by Sheep is a math puzzle video game, available for the Windows, Mac OS X, Linux, Android, and iOS operating systems. It's a game about friendship and solving math problems. 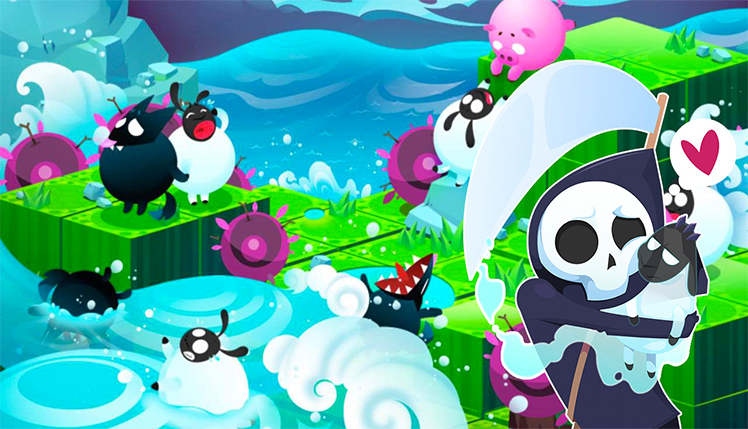 The Grim Reaper loves sheep so he conjures up a twisted plan to make some sheepy friends. 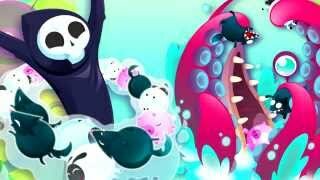 Grim can only be friends with the dead so he decides to flood the world. 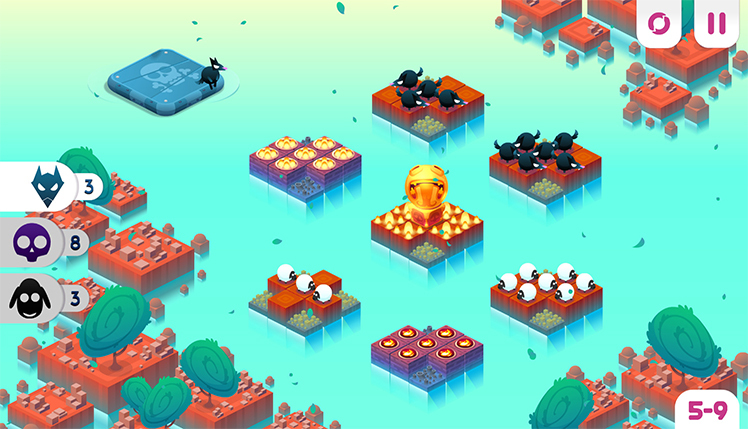 The sheep are trapped on several sinking islands so it's up to you to save them! 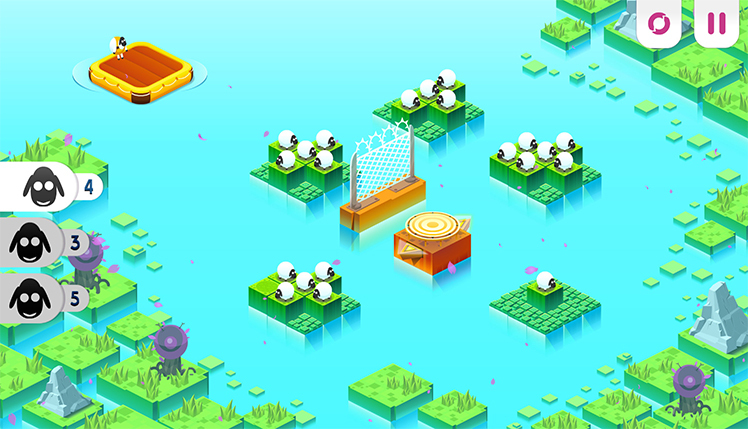 The raft can only hold a specific number in every level, though, so it's up to players to make that exact number. Accomplish this in lots of different ways. Burn the sheep and delete their numbers, or bounce them into the water. Sometimes the division is much more literal, with hungry dogs awaiting their treats from the Reaper. Solve the way through puzzles while working to keep the Grim Reaper from getting too lonely. With many different mechanics and an adorable art style, there's a lot in this game for anyone who loves a brain challenge. This game has cute art with a black heart. Its style of comedy is all about murdering sheep, but not too many sheep! There are countless ways of getting just the right number of sheep for the Grim Reaper, and players will use them all. 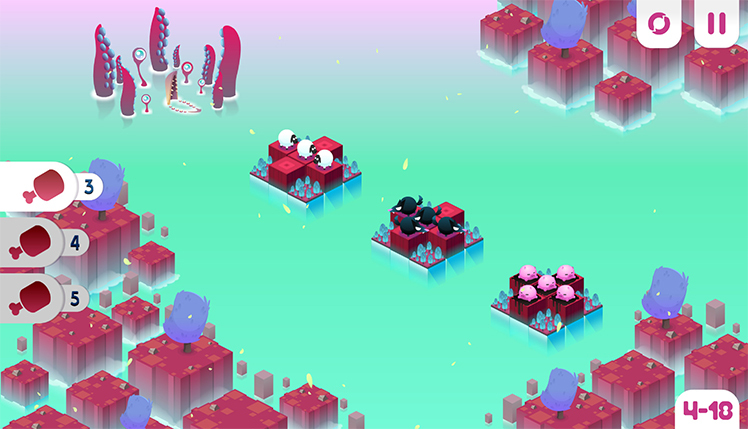 Bright colors and sweet drawings contrast with the actual puzzle mechanics in a really humorous way. However, there's a feature that turns off the blood and guts. This makes the game family friendly for any kids who might have an interest in this brain teaser style video game. With over 120 levels across four different worlds, the puzzles get progressively more difficult. Players have more than one way of accomplishing their goal of giving the Grim Reaper his friendly sheep. Learn new abilities and discover a variety of thoughtful challenges. 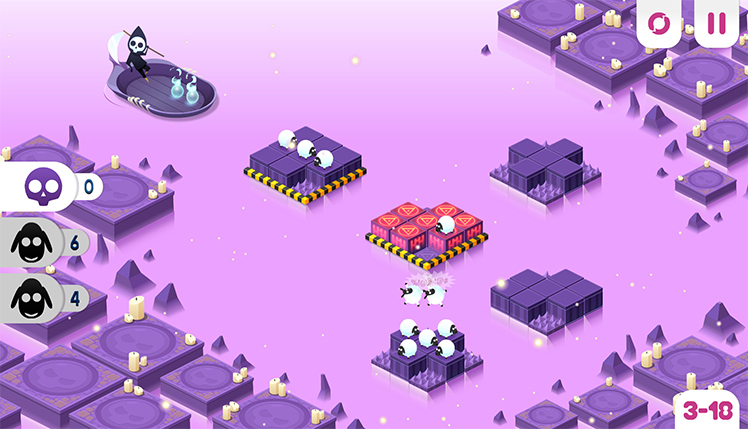 Add, subtract, and divide the sheep in order to satisfy Grim or sometimes other creatures in the level. Feed the wolves by slicing sheep in half but make sure there are enough that Death is still happy. The progression is perfectly paced, and all of the puzzles offer reasonable solutions that provide hours of entertainment. 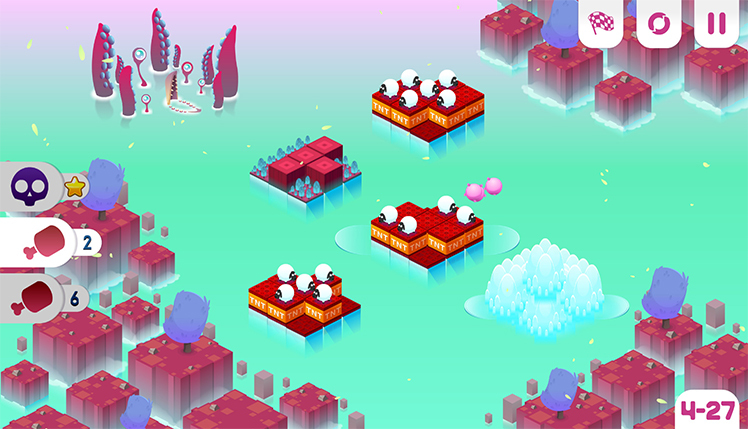 Divide by Sheep is a gem of a puzzle game. It features an adorable art style that quickly turns dark. The story matches it with a hilarious tale of friendship between the Grim Reaper and his beloved sheep. The puzzles are challenging but not ridiculous and offer lots of different ways to solve them. 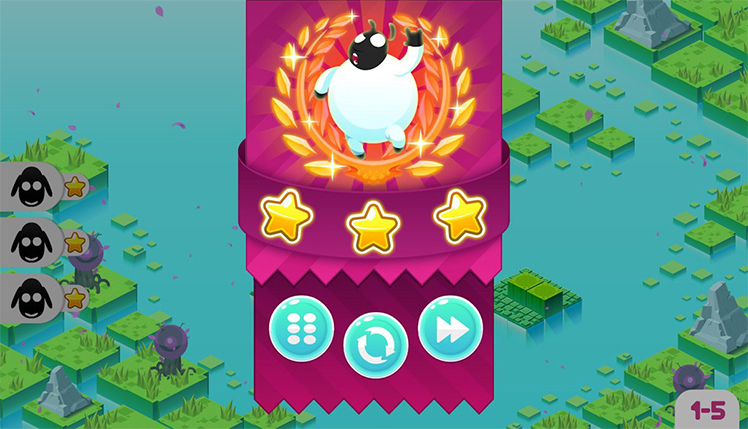 Use a host of abilities and add, subtract, or divide sheep based on what the objective is. There are over 100 levels for users to experience. With a parental control available to turn off gore, this game is even kid-friendly! It's sure to tickle anyone who loves a funny puzzle oriented video game. 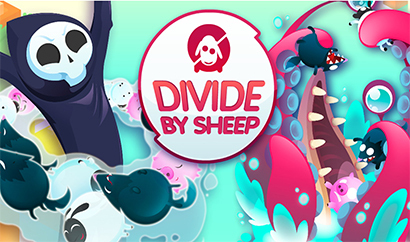 In Divide By Sheep, the Grim Reaper has a twisted plan to make some sheepy friends. Grim can only be friends with dead afterworld so he floods the world. Use your killer math skills and save as many sheep as possible! © 2018, Bread Team. Bread Team logo, Divide By Sheep, the Divide By Sheep logo, are trademarks or registered trademarks of Bread Team. in the United States of America and elsewhere. All rights reserved.